Both of these teams were surprising in the first round: the Spurs in their difficulty finally advancing and the Blazers in their seeming ease. It’s the old guard vs. the new guard in a fast-paced, exciting matchup that will include lots of outside shooting. Portland: Can Lillard keep up with Tony Parker’s quickness when on defense, both on-ball and off, while still being himself on offense? Can LaMarcus Aldridge win his matchup against a defensive legend at his position? 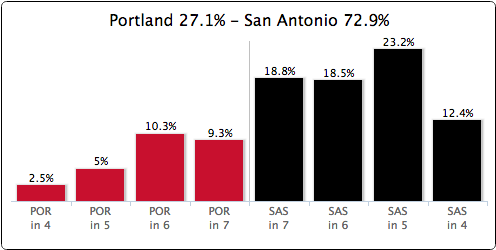 San Antonio: Can they keep Portland off the glass? Can they find a way to slow down the red-hot Lillard while still keeping Aldridge and the perimeter shooters in check? The data here is interesting: while the Blazers have the advantage at most of the starting positions (though likely partially due to more minutes played), the Spurs have the predictive models at their backs. Though Portland has looked excellent lately, I’m going to go with the coaching, experience, and depth to pull through, despite close games and a couple of big performances from the Blazers’ big two. Both squads had tougher times than anticipated shutting down their confident opponents in round 1, but now they’re in for perhaps the biggest showdown of the second round. With top-flight players galore on both teams, this series has all the makings of a classic. Oklahoma City: Can they get enough scoring from players 3-12 to supplement their two superstars? Can their bench keep pace with the Clippers’ Crawford, Collison, and co.? Can Ibaka play up to his competition in Griffin? Los Angeles: Is Paul healthy enough to stay in front of the uber-fast Westbrook for a whole series? Can Matt Barnes check KD without needing a double on every possession? Can DeAndre Jordan defend the rim against some of the league’s most explosive finishers? This is a battle of heavyweights on a finals-type scale, with both teams in the top three of the league’s overall rankings. Chris Paul is hungry to save his playoff reputation, but he has health questions after last series. 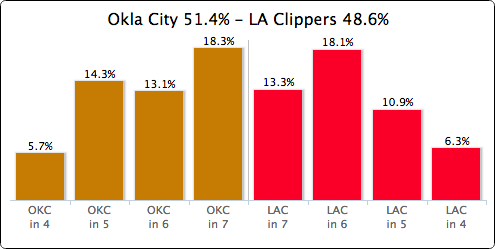 However, he’ll be able to run the offense well enough that the Clippers’ superior frontcourt and depth will continue to wear down the Thunder to the point of elimination. The Pacers limp into round 2 against a team that blew through its initial matchup with ease. 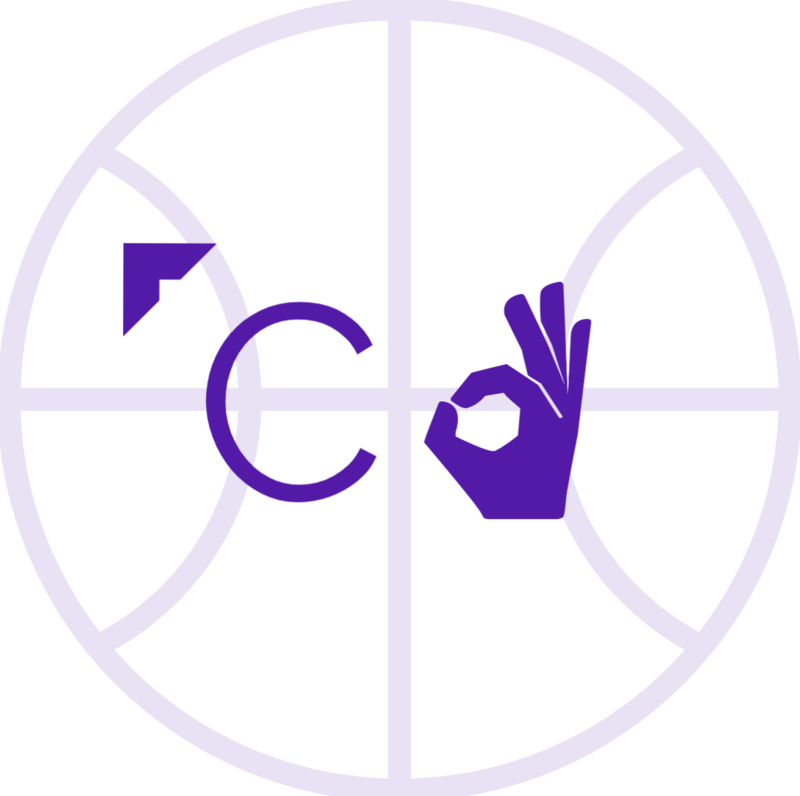 However, Indiana has all of the tools to make this series an excellent one, and the absence of a “stretch 5” in Washington should allow Roy Hibbert to show again why he was an All-Star this season. Indiana: Can this team forget its chemistry issues and fully get back to basketball? Will Roy Hibbert’s return to the paint give him a reenergizing? Can they slow down Wall and Beal in transition? Washington: How good of a job will Trevor Ariza do on the oft-enigmatic Paul George? Can Nene bring the same physicality he did to Joakim Noah to David West? 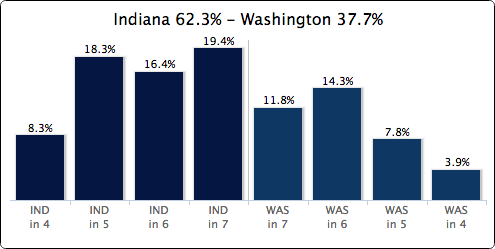 Washington has the young legs and the confidence factor, while the Pacers have been the better team over the full course of the season. However, despite much of the year-long data favoring Indiana, the Wizards’ long rest period and the superstellar play of John Wall on both sides of the ball will define this series in an upset. Miami: Can the Heat prove that their getting swept by Brooklyn this season was a fluke? How big of a factor will Dwyane Wade be? Can they use their speed to beat slower Brooklyn by forcing turnovers and running in transition? Will Ray Allen have a big series against his famous former teammates? Brooklyn: Are the well-aged Nets tired from their seven-game first round series? Can Pierce and Garnett evoke whatever power they do have that seems to gives LeBron troubles? Can they avoid giving up big runs (especially when playing in Miami)? 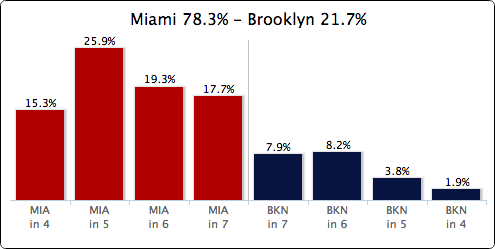 Despite Brooklyn’s success this season against Miami, they’re coming off a grueling seven game series against Toronto, whereas the Heat walked over the Bobcats and haven’t played for an entire week. The Heat will be rested, prepared, and motivated enough to defeat the Nets, despite a couple of hiccups. Way off on the PG advantage for the Spurs/TB series. Thanks for the input, James. Tony Parker is definitely a game-changer at his position, and one of the most talented players in the league, as he showed in last night’s blowout. However, our model and ESPN’s model both prefer the impact Lillard has on his team to that of Parker, whether it’s a product of the player’s talent, the system, or both.